What if a novelist celebrated as a pioneer of African-American women's literature turned out not to be black at all? IN THE LATE 1980s, scholars of African-American studies carried out the most impressive American literary recovery project to date, excavating and reprinting the works of numerous unjustly forgotten African-American writers. The most ambitious of these efforts was Oxford University Press's 40-volume Schomburg Library of Nineteenth-Century Black Women Writers, published in 1988 under the direction of Henry Louis Gates Jr., currently the chair of Harvard's department of African and African American Studies. But despite continual scholarly interest in Kelley-Hawkins as an important voice of the period, the woman who Gates credits with inspiring the Schomburg Library has never fit comfortably within the African-American canon. Most puzzling has been the apparent whiteness of her characters, who are repeatedly described with blue eyes and skin as white as ''pure'' or ''driven'' snow-a conundrum that critics have largely sidestepped by arguing that these women would have been understood as ''white mulattos,'' or very light-skinned women of color, by Kelley-Hawkins's original audience of black readers. Furthermore, while the novels of contemporaries like Frances E.W. Harper or Pauline Hopkins are explicitly concerned with racial uplift and protest, ''Four Girls at Cottage City'' and ''Megda'' follow a group of adolescent female friends in eastern Massachusetts from carefree youth through Christian conversion to appropriate wifehood, with no mention of the difficulties facing black women. Meanwhile, Kelley-Hawkins herself remained a complete historical cipher. While she had been identified as an African-American writer as early as the 1970s, when her first novel, ''Megda,'' was mentioned in several reference works, the most basic facts of her life-down to the date and place of her birth-were totally unknown. As it turns out, these novels, and their author, are far more anomalous than scholars have realized. Judging from archival documents that I have recently uncovered, Kelley-Hawkins does not appear to have been African-American at all. When I set out to write an entry on Kelley-Hawkins for the ''African American National Biography'' (forthcoming from Oxford University Press) the existing information on her life amounted to only her name, a photograph of her from the frontispiece of ''Megda,'' and grounds to assume that she married between 1891, when she published ''Megda'' as Emma Dunham Kelley, and 1895, when ''Four Girls'' appeared under her newly hyphenated last name. Scholars have speculated that she probably lived in Massachusetts because her books were published in Boston and her characters vacation on Martha's Vineyard, so I began my research at the New England Historic Genealogical Society on Newbury Street. Looking through the births recorded in the Massachusetts Vital Records, I found only one Emma D. Kelley born in the time frame that would make sense for someone publishing in the 1890s. Though I remembered a reference to the town of Dennis on Cape Cod in ''Four Girls at Cottage City,'' I thought that surely the white baby born there on Nov. 11, 1863, could not have grown up to be the woman whose novels are celebrated in the African-American literary canon. So I reluctantly wrote my entry based on the limited information available. Months later, entirely out of the blue, I received an email from Richard Noble, a rare books librarian at the John Hay library at Brown University, who found my name online in connection with my earlier scholarship on Kelley-Hawkins. He had recently come across what appears to be the only extant copy of the true first edition of ''Four Girls at Cottage City,'' issued by the Continental Printing Company in Providence in 1895. (The edition Gates discovered, published by James Earle of Boston in 1898, now appears to be a second edition.) Noble took a special interest in Kelley-Hawkins because the title of her first novel, ''Megda,'' seemed strangely familiar. As he soon recalled, the name ''Megda Hawkins'' appears on a memorial list at the church he attends in Providence, St. Stephen's Episcopal. Soon he tracked down her 1984 obituary in the archives of The Providence Journal, which established that she was in fact the daughter of Emma D. (Kelley) Hawkins. This bit of chance information turned out to be the key to finding Kelley-Hawkins's biography. A check of the 1910 Federal Census revealed an Emma D. and Benjamin A. Hawkins, married since 1893, living in Lincoln, R.I., with their two daughters, Gala E. and Megda D., and also Emma's widowed mother, Gabrelia. 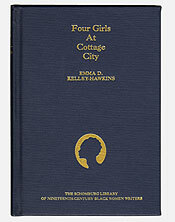 The date of the marriage fell within the period in which she would have changed her name, and the name of her second daughter made me confident that this Emma D. Hawkins was in fact the author of ''Four Girls at Cottage City'' and ''Megda.'' Her age, her mother's name, and the place of birth provided further evidence that the white baby born in Dennis in 1863 was in fact the woman I sought. Moving backward, I found the record of her parents' 1859 marriage, which provided all four of her grandparents' names. I located them (along with a sizable extended family) in the censuses from 1840 to 1860. Moving forward, I followed Kelley-Hawkins in Rhode Island in the first three decades of the 20th century. The last documents I uncovered were the obituary marking her death at home in Rumford on Oct. 22, 1938, and the notice of her burial in Moshassuck Cemetery in Central Falls. With each new document, I was confronted with a startling fact: In four generations, over the course of 80 years, Kelley-Hawkins and every single member of her family are identified as white. At first, I wondered if Kelley-Hawkins and her family were only ''passing'' as white. However, the fact that both of her parents were born in Dennis-a small seafaring community-and that all four of her grandparents, along with a sizable extended family, lived there makes it unlikely that they could have falsely represented their racial identity to the town clerks at the time of their marriage, the birth of a child, or on the censuses. Both sides of her family had roots in Dennis, and one of her grandparents would have presumably been designated with an ''M'' for ''mulatto'' if there had been any question regarding his or her racial heritage. Of course, it is impossible to say definitively that Emma Dunham Kelley-Hawkins had absolutely no ancestors of African descent at some point farther back than the record shows. The ''one-drop'' logic that has long dominated American understandings of race can cast doubt on the racial identity of any seemingly white person. If we understand race as a social construction, there is no biological truth to uncover, just a social tradition that considers parentage the deciding factor when skin color proves inconclusive. Kelley-Hawkins was as white as anyone whose parents and grandparents claim to be white, and clearly identified herself as such when given the opportunity throughout her adult life. With the mystery of Kelley-Hawkins's basic biography solved, another mystery remains: How have her overwhelmingly ''white'' texts successfully passed as black for so long in the absence of any corroborating historical data? 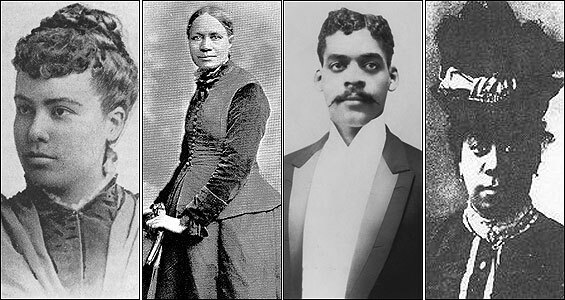 And how does this discovery change our understanding of African-American literary history? Most of the critics who have written about Kelley-Hawkins insist that she included a photograph of herself as the frontispiece of ''Megda'' in order to clearly identify herself as a black author. (Claudia Tate has been the only scholar to acknowledge the racial ambiguity of the photo, suggesting that the author's race might have been interpreted differently by white and black audiences.) But in light of this new biographical information, the photo does indeed seem racially indeterminate, if not simply the photo of a white woman. In addition, the readings of Kelley-Hawkins's novels that have been offered over the past 20 years-as critics have labored to account for the overwhelming, almost aggressive whiteness of her characters-now seem notably strained. But a reconsideration of not only Kelley-Hawkins's racial identity but also the historical context of her novels suggests that a far different reading is in order. Suddenly, they look not at all like hopeful African-American novels but like reflections of white racial anxiety in one of the most violently racist decades in American history. In the scholarship, much has been made of Kelley-Hawkins's focus on the town of Cottage City on Martha's Vineyard, part of the area now called Oak Bluffs. In her introduction to ''Megda'' in the Schomburg Library, critic Molly Hite cites Gates in claiming that this town's long history as a black resort would have been the biggest clue unlocking the racial content of the novels for black readers. But there is a problem with this conclusion. Oak Bluffs' history as a black resort area does not extend as far back as the 1890s, when Kelley-Hawkins's novels were published. 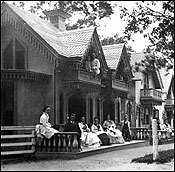 In her 1994 book ''The Other Brahmins: Boston's Black Upper Class,'' Adelaide M. Cromwell, professor emerita at Boston University, holds that in the late 19th century Cottage City was largely a white middle-class enclave where many of the property values were much lower than in the rest of Martha's Vineyard. The small population of black people on Martha's Vineyard before the 20th century were more likely domestic workers than vacationers. Arthur Railton, editor of the Martha's Vineyard Historical Society's journal, confirms this view. According to Railton, black vacationers began to arrive on the island in significant numbers only after Charles Shearer-a man who was born into slavery and later became a college professor-opened the first inn to encourage black patrons in Oak Bluffs in 1912. (The Shearer Cottage is still run by his descendents.) 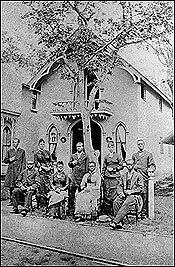 Furthermore, African Americans only began to own property there in any significant numbers after World War I, when a changing economy enabled members of the black upper class to purchase houses in Oak Bluffs at up to triple their previous value. I began my research on Kelley-Hawkins hoping to add to our understanding of the canon of black women's writing that has been so painstakingly reconstructed after more than a century of forgetting. But in the end, subtracting Kelley-Hawkins from that canon should produce a more accurate understanding of that tradition. After all, previous scholarship on Kelley-Hawkins has carried the burden of constructing a coherent race-based literary tradition in which her novels connect meaningfully to those written by trailblazing black feminists of that time. We have stretched our understanding of how black women have written in America to incorporate texts that do not fit. Henry Louis Gates Jr. says he does not know how Kelley-Hawkins came to be identified as African American. ''I'm intrigued by the idea, however, that so many scholars have concluded that this woman was black, and it certainly will be interesting for us to figure out why,'' he said in a telephone interview. The future reception of Kelley-Hawkins's novels is also uncertain, now that the basis of her literary reputation has been called into question. The next chapter in this story of mistaken identity remains to be written. Holly Jackson is a doctoral student of English at Brandeis University, specializing in American literature and culture from the Civil War to the Civil Rights movement.